Although a Dr Strange bobble head toy lurks in his desk drawer, and he eats cucumbers whole (! ), Tim seems otherwise like a fairly normal guy. Well, almost. He once spent nine hours standing with his brother on a chilly day in Times Square, New York, just to see a big ball drop on New Years Eve! Tim’s travels have included passing through an Amish community in Pennsylvania—one of the most unusual places he’s ever visited. He loves curry, and is a big fan of Marvel movies and comics. After studying Medicine at The University of Adelaide (graduating with a Bachelor of Health Sciences) and doing a two-year Ministry Apprenticeship at Trinity Church Brighton (where he ran the youth program), he then spent a year as a purchasing officer at United Fasteners, before completing theological study at Bible College SA. 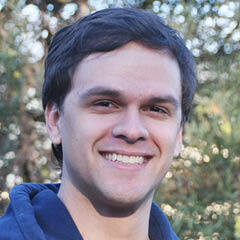 Tim oversees Trinity Church Adelaide’s youth ministry, Fusion, and partners with parents in caring for high schoolers. He is also involved in the wider youth ministry scene in Adelaide with Redefinition Youth Ministries and Equip Youth Multiply. Tim is passionate about his wife, Chantelle, supporting the Port Adelaide Football Club, playing video games and reading books; but his special delight is seeing people come to trust Jesus as their Lord and Saviour.